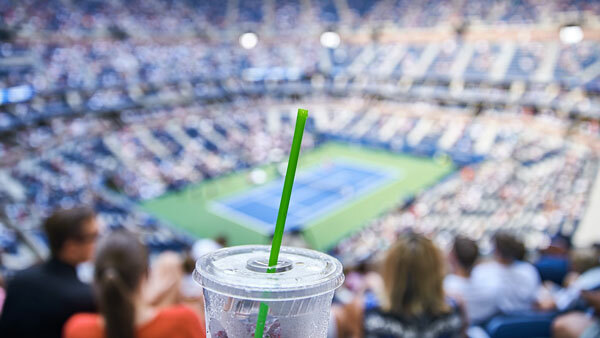 New York City (September, 2018) – Attendees at the 50th US Open™ are able to enjoy a new sustainability initiative: Vio® biodegradable* straws by WinCup®. This follows increasing consumer demand for alternatives to traditional plastic straws. Overall, 53% of consumers say it’s important for restaurants to have eco-friendly practices, according to Technomic’s 2017 Value & Pricing Consumer Trend Report. As a result, foodservice venues of all kinds are looking to replace traditional plastic straws while still allowing consumers to conveniently enjoy beverages on the go. Vio® is the first plastic straw to biodegrade in a landfill. This innovative product performs just like traditional straws, with the added benefit of biodegrading 88.5% over 7 years*. “We’re thrilled that Vio® has reached a global audience at the US Open™, where it’s supporting performance and sustainability goals,” says Mark Miranda, Director of Marketing & Business Development at WinCup. Vio® biodegradable* straws are available in the most popular sizes, both unwrapped and individually paper wrapped. They’re part of the complete line of Vio® biodegradable* EPS foam cups and containers with coordinating biodegradable* lids and straws. The entire Vio® line combines classic performance with innovative technology to answer the call for more sustainable products with exceptional value. VIO® and WINCUP® are registered trademarks of New WinCup Holdings, Inc. US OPEN™ is a trademark of United States Tennis Association Inc. WinCup is not affiliated, sponsored, endorsed, licensed or in any way associated with United States Tennis Association and the United States Tennis Association does not approve, endorse or sponsor WinCup or its goods/services.